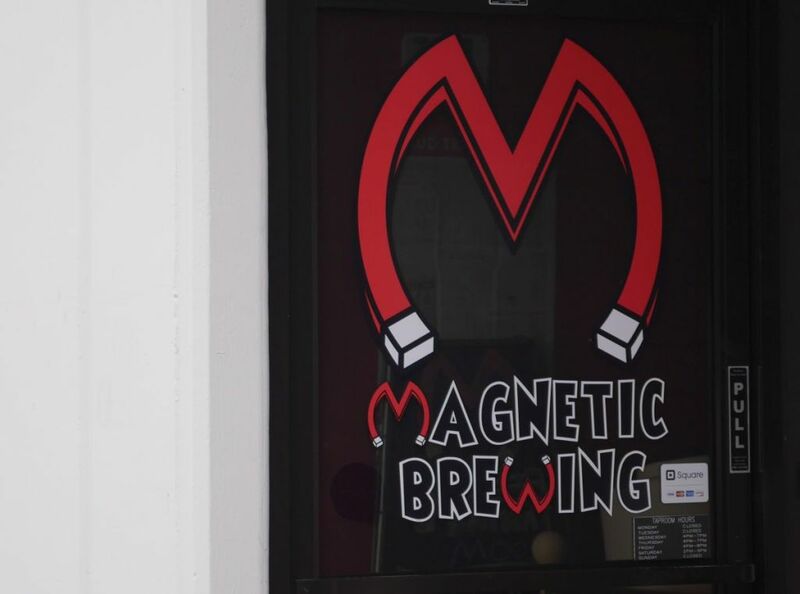 Magnetic Brewing is currently in their soft opening phase and when I visited had only been open for two weeks and had five beers on tap. The head brewer is said to have some 8 years of home brewing experience and it certainly shows in the beers that he is pouring. The brewery has also been in development for quite some time and many have been eagerly awaiting its debut. I had heard a lot of praise from the few people who visited earlier and overall I was not disappointed. They are certainly doing a great job for such a new brewery. In total I tasted the brown ale (8%), wit beer (8%), Amber, IPA, and pale ale. 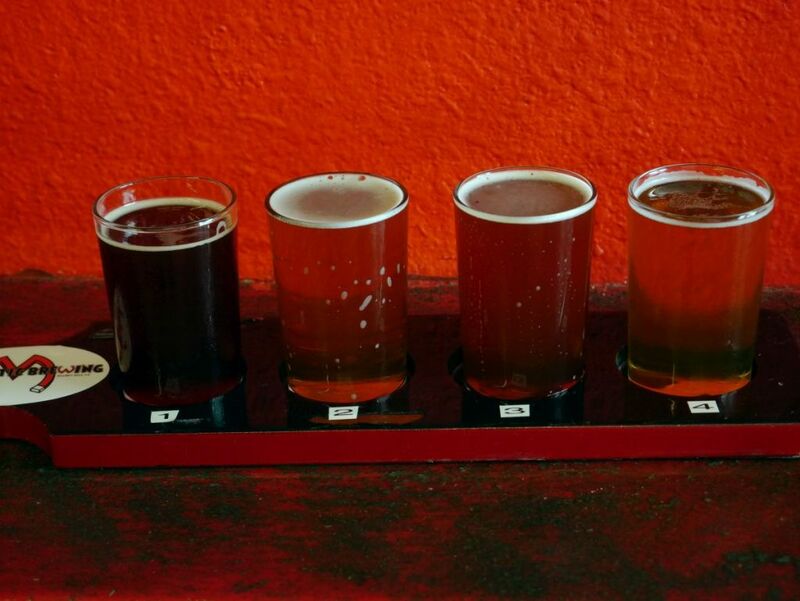 I mention the ABV of the first two because they are a bit higher than typical for the styles and it will help explain some flavors I noticed in them. To start with the brown ale is a deliciously smooth and medium sweet beer brewed with brown sugar added. The malts give it a tasty caramel flavor that blends nicely with the sugar to give it just the right amount of sweetness while remaining drinkable. Considering its strength it had only a fairly minor alcohol bite at the back end. The wit beer really let the added spices shine through its higher alcohol that smooths everything out and gives it a much more chewy body. It almost tasted like a cake with the combination of sweetness and spices. The alcohol doesn’t hide here much and it has a medium boozy finish but I still thought it was overall very tasty. The amber has much the same caramel flavor as the brown from the malts with some mild earthy hops. I thought the hops blended well with the rest of the beer but it got out-shined by the more flavorful earlier beers. The IPA first hit me as being a bit too piney but as it warmed up and I got through the taster I found it to have a great balance with a light malt body and flavors of resin and pine. The IPA drinks really nice and probably would have made a great pint. Comparatively, the pale was a bit strange to me. It smelled like sharp aged cheese and the flavor was overly sweet with a lot of pineapple and mango flavor. It seemed like a solid recipe behind it but it didn’t come out right. I talked to some brewers later who suggested that the strange scent I noticed has to do with old hops. 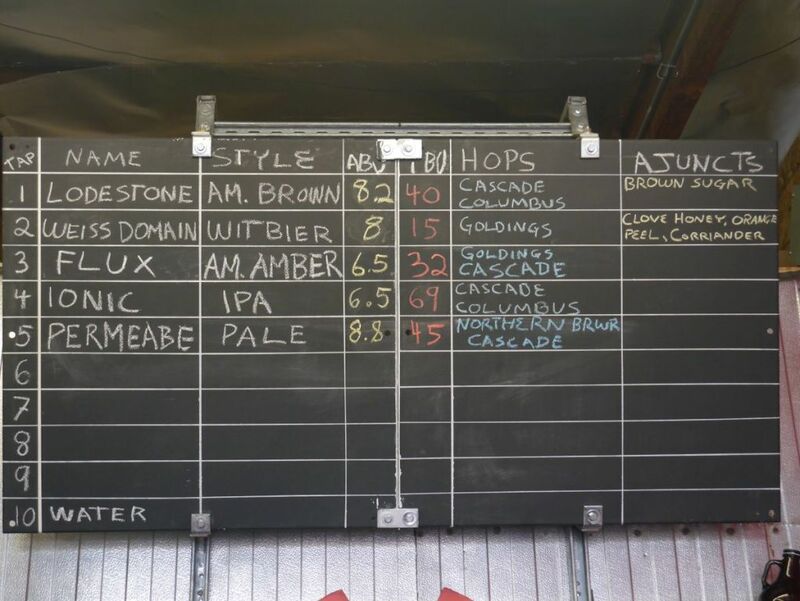 The disappointing pale aside, I thought the lineup at Magnetic was quite good and they have some serious talent in the brewer that will go on to do great things. Fans of sweeter stouts and porters will certainly enjoy the brown and it will be hard for a hop head to not enjoy the IPA. Because they only had five beers I will select a top 2 instead of the usual top 3. 3 Floyds has become such a cult following that most of their popular offerings that are bottled are sold out within a few days once they are made available. The coveted zombie dust and double ipa bottles disappear as quickly as cans of heady topper. Though you may be able to find some double IPA at nearby liquor stores they aren’t stored cold and the ones I found were too old to pick up. Going to the brewpub on a weekend will end up with a wait of at least 40 minutes. It is worth the wait to get a seat because fresh zombie dust from the source is delightful as are the other offerings. Though I had heard that 3 Floyds plays death metal at the brewery it is not all death metal all the time. They cycle between metal and punk rock and other fun songs. The scream vocals mostly blend in so they aren’t much worse than the average music at a brewery or bar. While I was at 3 Floyds I didn’t get to try very many beers because they don’t offer taster flights and I didn’t want to get seriously wasted trying 10 ounces of each of the double IPAs. 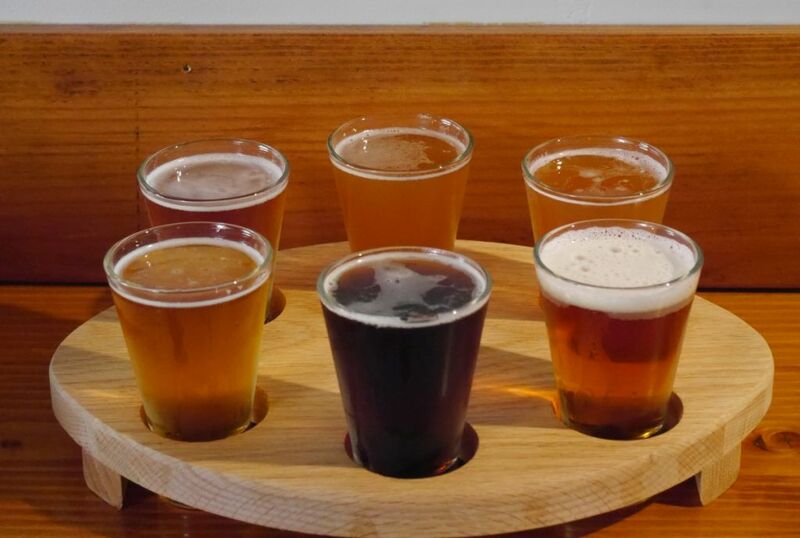 (It is a brew pub atmosphere because they serve food as well so I understand the lack of taster flights. I heard great things about their food but I didn’t end up ordering any while I was there). 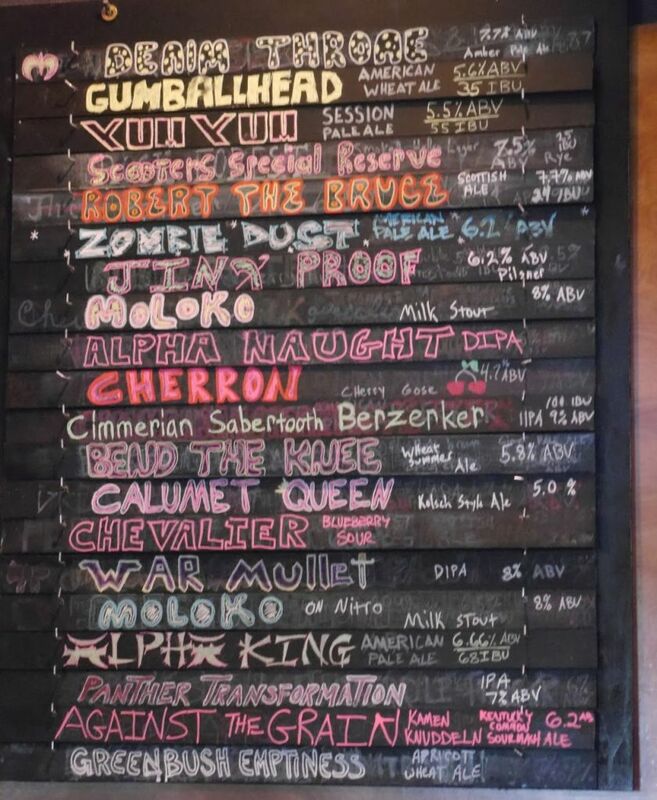 I had an 8oz of Zombie Dust, my husband had a Moloko Stout on nitro, and I had a Cimmerian Sabertooth Berzerker double IPA and finally a Chevalier blueberry sour. After hearing tons of hype for Zombie Dust it is hard to be impressed but I knew with the first sip that this was a fantastic beer that is very much worth all the hype. It was extremely light body and bursting with hop flavors of both citrus and tropical fruit (primarily pineapple). It is deceptively sessionable considering it is 6% and feels much lighter than that. The bitterness was very mild, coming across just enough to let you know the hops are present. Fresh zombie dust from the source! The Cimmerian Sabertooth Berzerker double IPA was delicious from the first sip. 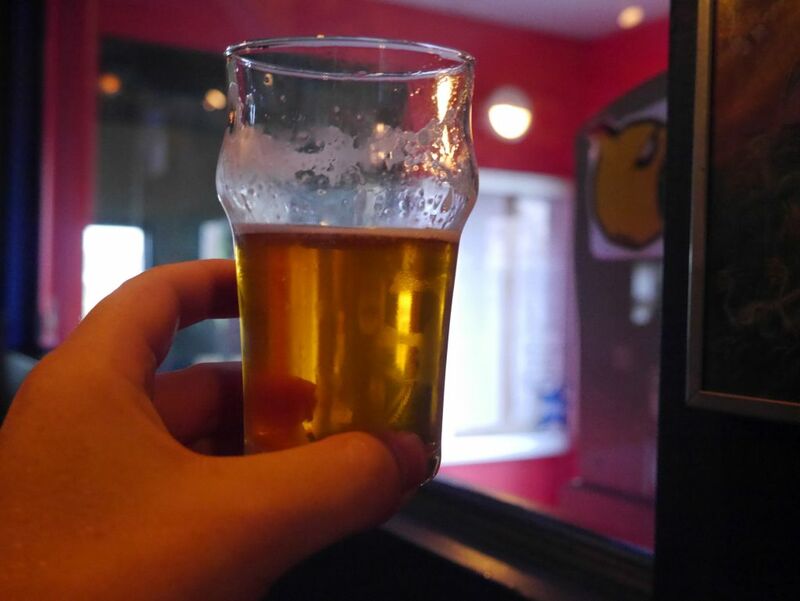 It pours a delightfully hazy yellow orange with a powerful golden hop flavor and just the right amount of sweetness. Many beers in similar style become syrupy but there is none of that here. Though it has a solid bitterness I didn’t feel it wrecking my palate. The beer ended nicely with some stone fruit and peach flavors. It was overall a very impressive double IPA. I didn’t drink much of my husband’s Maloko stout on nitro but from what I had it was a well-crafted stout with a solid chocolate flavor and very creamy. This one also hides its alcohol extremely well and I wouldn’t have known it was 8% except for the very mild booze on the back end. I ended with the Chevalier blueberry sour. This was a properly sour beer, just short of puckering. It is certainly an acidic sour but it blends with plenty of blueberry flavor at the back end. Considering everyone talks about Three Floyds for their hoppy beers and imperial stouts I was surprised by how fantastic this sour was. 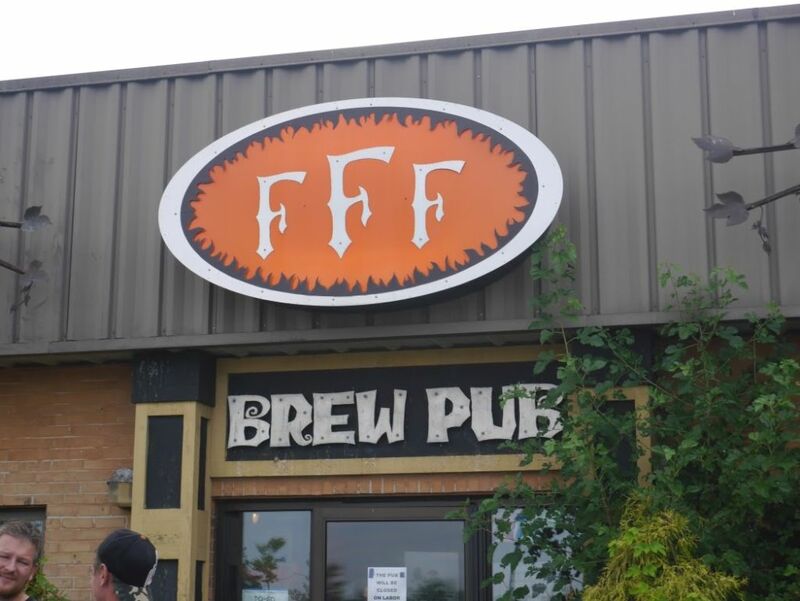 Overall, I would certainly visit 3 Floyds again if I am in the area on a weekday so that I can load up on some awesome fresh from the brewery beers and have some more pints of delicious fresh from the brewery beers. If you are visiting Chicago for a few days it is worth the 45 minute drive and nearly hour wait for some of the best hoppy beers around. Hopefully next time I will be able to get my husband to drive me like he did this time because those double IPAs are fantastic. If you come by the brewery to buy some Zombie Dust in bottles make sure you go during the week and check the web site for what to-go beers are available the day you go because they rarely last into the weekend. Also after having a fairly disappointing six pack at a nearby store I highly suggest that you not buy any if you can’t find it at the brewery. The stores nearby have very little in refrigeration so the double IPAs they stock are not likely to represent the same delicious quality. Also bring along a cooler or store the beers inside the air conditioning of your car on your drive back to your hotel room. 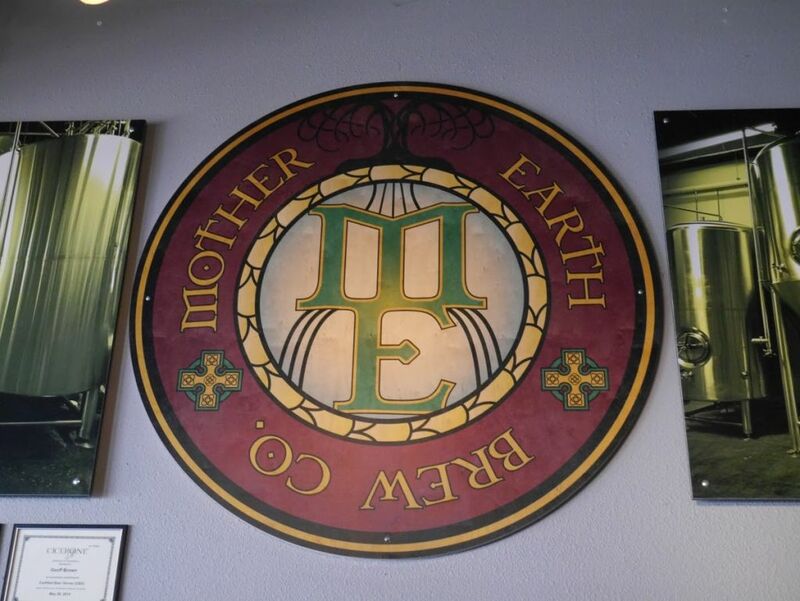 Mother Earth is one of those breweries that I heard a lot about but rarely tasted. 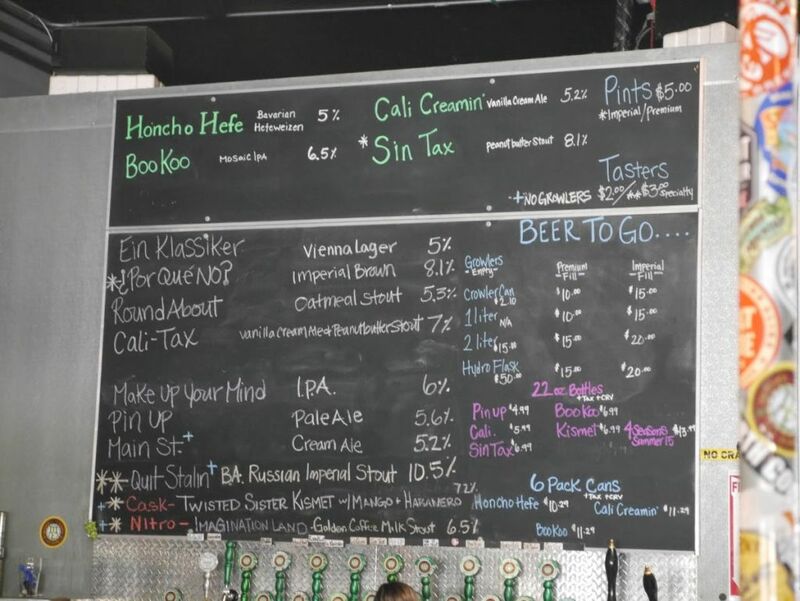 Fairly recently I tried their Boo-Koo IPA for the first time and knew I should visit the tap room sometime soon. Located in the center of Vista, Mother Earth is thankfully close to the 78 freeway and easy to find. 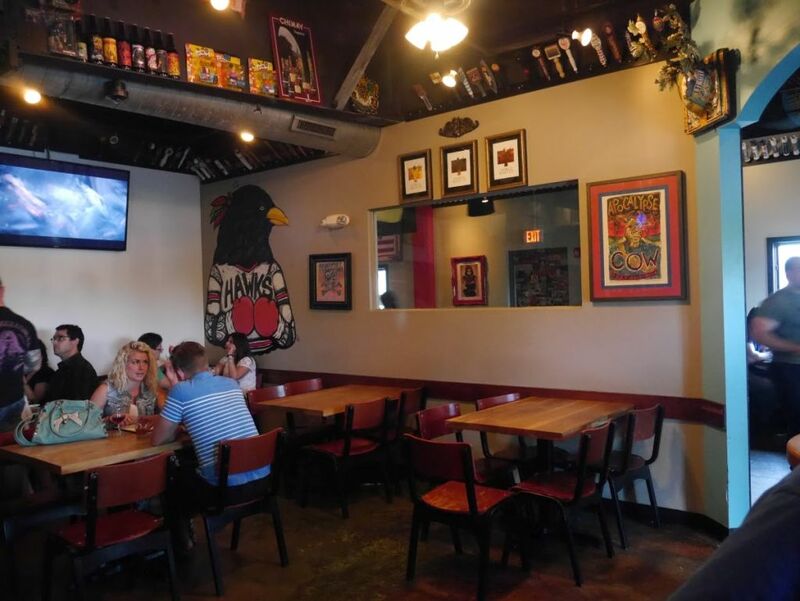 The tap room is large and has a good amount of seating and room for dogs. 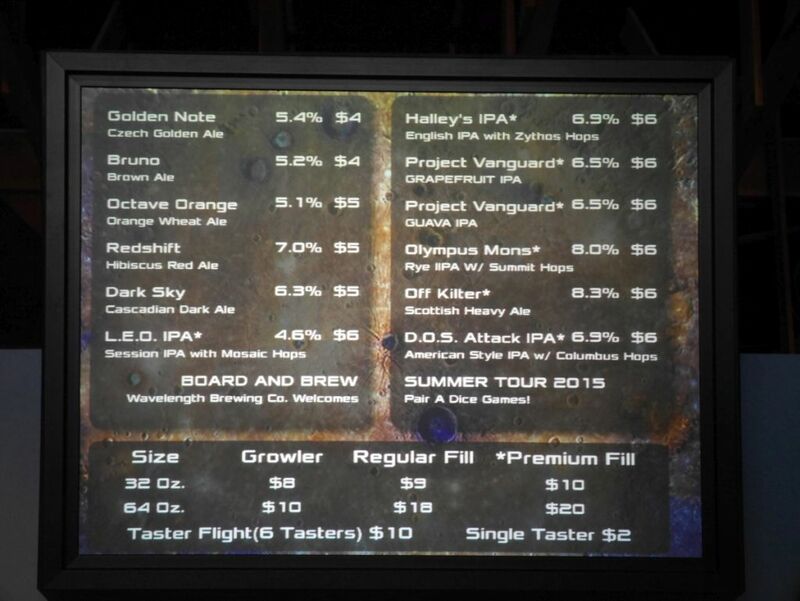 Aside from four core beers on tap they also had a few interesting special release beers available. 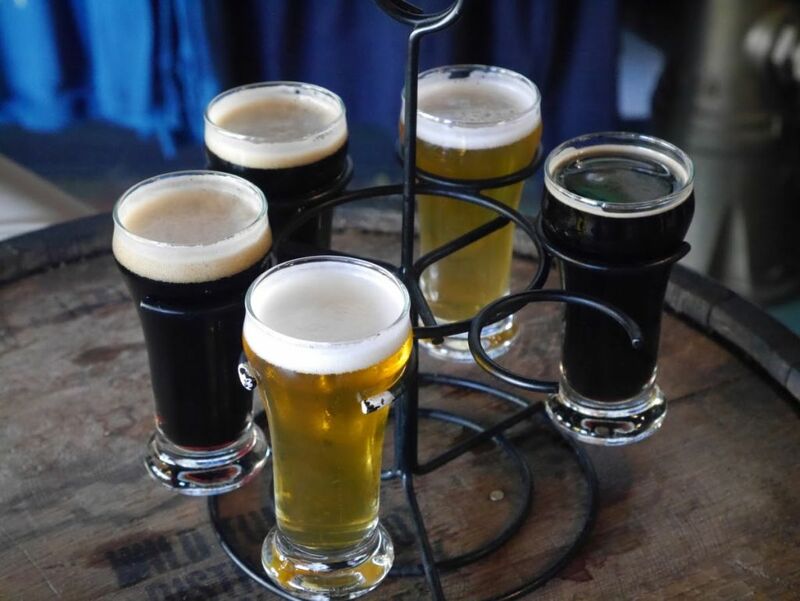 I tried the Boo-Koo IPA, Roundabout Oatmeal Stout, Make up Your Mind IPA, Sin Tax peanut butter stout, and Quit Stalin bourbon barrel aged imperial stout. The Boo-Koo is a delicious light body and light colored IPA with lots of citrus and tropical fruit and medium bitterness. This one recently showed up in six-pack cans and is one of their best major beers. The Roundabout Oatmeal Stout was listed as a smaller specialty beer but it was so good I wouldn’t be surprised if it joins the main lineup at some point. The beer was dry and roasty with a nice bitter chocolate finish. Though it was a low 5.4% alcohol it was bursting with flavor. I liked it so much that I took home a crowler (32oz can they fill on the spot for you to take home). The Make Up Your Mind IPA was a delicious tropical fruit/juicy IPA also with the light color and medium bitterness. The biggest difference between this and the Boo-Koo is the sweeter hop flavors that dominate. The Sin Tax is a strong 8% peanut butter imperial stout with an intense and overpowering peanut butter flavor that adds a bit of sweetness and makes the beer seem a bit syrupy. The peanut butter flavor is similar to the Belching Beaver peanut butter milk stout. The underlying stout is a bit typical and tasty but I found this one too sweet. My husband liked it though. I ended with the Quit Stalin bourbon barrel aged imperial stout. This was very impressive, giving a strong stout background and plenty of sweet bourbon flavor. Everything balanced quite nicely, avoiding any strong boozy flavors. Mother Earth has two locations and I visited the Main Street location. Their web site says that this location tends to get a more wide selection of beers. There is also a home brew shop next door. Overall Mother Earth is a very impressive brewery giving the right focus on their core beers while also brewing some smaller batch stuff. 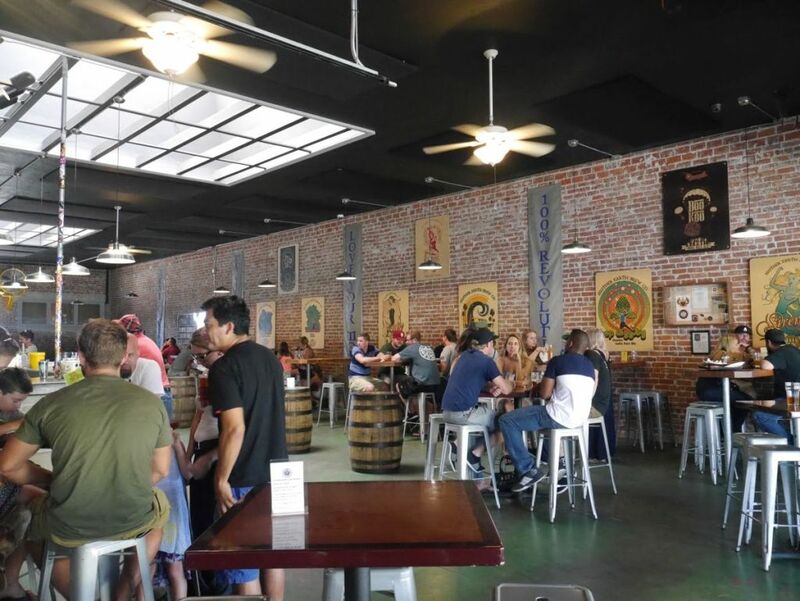 I happened to visit them after Wavelength brewing next door and I found Mother Earth to be the more impressive of the two, though they are also much older and established. 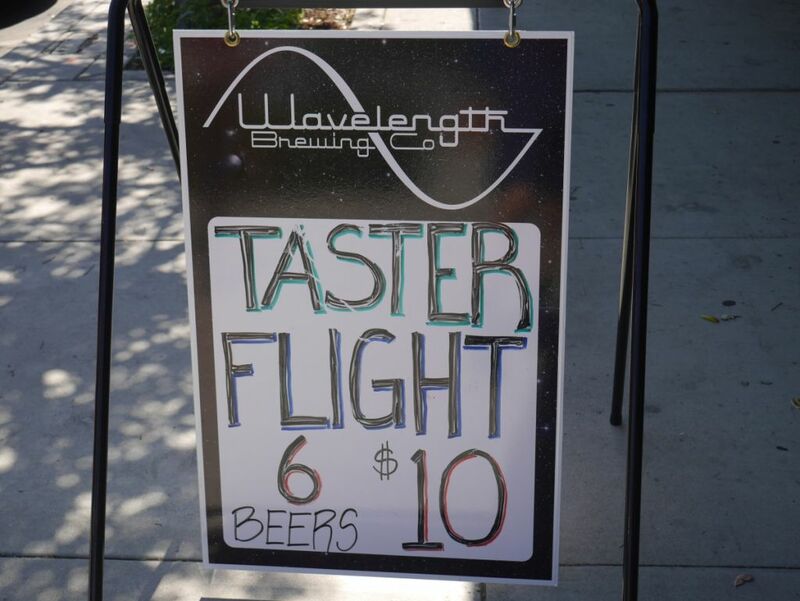 Located walking distance from Mother Earth Brewing is a new brewery called Wavelength with a science-fiction theme and a nice open welcoming space. The day I stopped by they had a gaming day (board games) with a number of people gathered to play against each other while enjoying beers. They also like to project the live feed from the International Space Station on the wall. The beer selection was fairly large for what I expect to see for a young brewery. There were plenty of interesting additional ingredients used. While I was there I tried the Halley’s IPA, an English style IPA, Grapefruit IPA, Guava IPA, Olympus Mons Rye IIPA, Red Shift hibiscus red ale, and Dos Attack IIPA. Halley’s IPA was a solid English style IPA with a good mix of apricot and tropical fruit flavors from the hops and a medium amount of bitterness. The grapefruit IPA was much more intense on the grapefruit than most local offerings. The grapefruit flavors were so strong that I had a hard time detecting much from the underlying beer itself. It was pretty much like drinking grapefruit juice with a similar strong aftertaste to what you would expect. The guava was similarly fruit forward although I could taste a little more of the underlying IPA behind it. The citrus hops seemed to blend well with the guava. This one was a bit more crisp and less bitter than the grapefruit without any crazy aftertaste. The Olympus Mons Rye IIPA was a combination of intense earthy flavors from the rye and an even more powerful smoke flavor from peat malt in the background. Any hop flavors got buried under the two strong flavors leaving a strong bitterness to round it out. I found this beer quite difficult to enjoy and did not end up finishing the taster. The Red Shift hibiscus red had a very nice combination of caramel and dark fruit flavors in the malts, making it similar to a porter at times. The hibiscus flavor did not come in the form of the usual sweet flavors but served as a bittering agent giving it a strong bitter after taste. To me the hibiscus clashed a little too much with an otherwise strong red ale. Finally the Dos Attack IIPA was a mostly hop forward brew with bright flavors of guava and tropical fruit on the front end. Sadly, these flavors get overpowered by a soapy after taste at the back possibly caused by too much of one of the hops. Like the hibiscus red before it, the after taste took away from what seemed to be an otherwise solid beer. I did not finish this taster either. 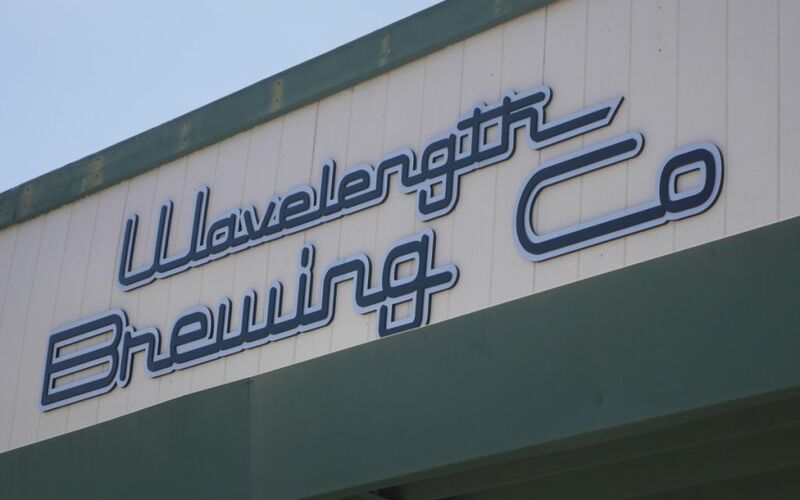 Wavelength is barely six months old and many of the beers are still a work in progress. None of the beers I tasted jumped out at me in such a way that I would say you should try that one. I also did not try their lighter options so I don’t know if they are getting those right. Still, if you are in the mood for hops presented in a now common San Diego style you should head next door to Mother Earth instead.